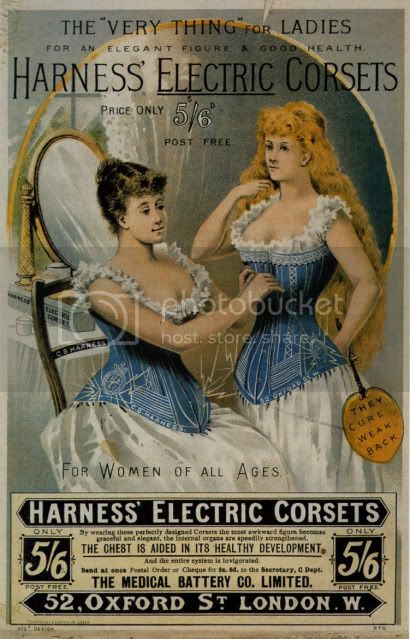 GOOD GOD ALMIGHTY JESUS am I ever glad women only wear corsets for recreational purposes these days. On the other hand, this one time when I had to fit into a bridesmaid's dress that was a size too small, I really wanted to run out and find one of those Scarlett-O'Hara-esque laceup jobs. But if I had, I can assure you beyond any doubt that I would NOT have bought AN ELECTRIC ONE. Yikes. It's so funny to me how they marketed these as beneficial to your health, when I'm sure all they caused were back problems and broken ribs. I have absolutely no idea what those prices could possibly mean. Ha! I didn't even notice that. I wish all prices were presented as reduced fractions. 5/6 ....there were 20 shillings to a pound,240 pence to a pound and 12 pence to a shilling. So this was roughly a quarter of a pound, or just over a crown ( which was 5 shillings. )This translates to 27.5 pence in decimal coinage ( which I regard as a foreign contraption). In US dollars it converts to 0.45 of a dollar in todays exchange rate. For future reference, in case you come up against pre-decimal coinage again, a Florin was two shillings, a Half a Crown 2 shillings and sixpence, and a Guinea, a commonly used sum in adverts was £1 1s or £1.05 in decimal coinage. I grew up with pre-decimal coinage and had to add/subtract/multiply and divide in my head without the dubious benefit of a calculator. Hope this helps. Pam.